이 청자 주전자는 고려시대 청동주자의 형태를 모델로 제작한 작품으로 유약과 태토, 굽받침 기법에서 고려청자 초기의 특징을 잘 보여주고 있다. 이와 유사한 작품이 일부 있지만 주전자로서 최고의 상태를 보이고 있으며 전체적으로 그 형태 및 제작이 뛰어나다. 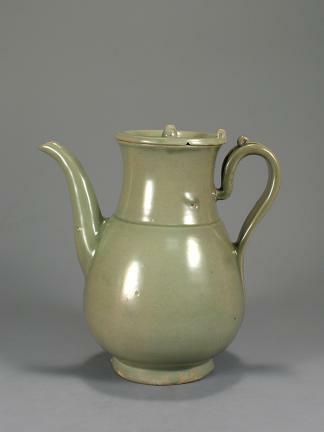 This celadon ewer is modeled on the bronze pots of the Goryeo Dynasty, and exhibits the typical characteristics of celadon wares of the early Goryeo Dynasty, such as the glaze, the clay body, and the method of supporting the foot during firing. It is the finest example among ewers of its kind, its overall shape and form displaying the dexterous skill of the potter.